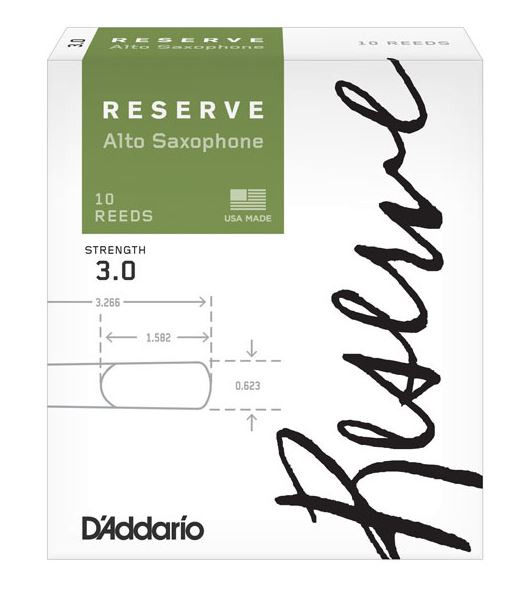 The Reserve Alto Sax reeds are a thick blank design that offers a rich, warm tone. A heavy spine that promotes dynamic flexibility and exceptional tone quality in all registers accompanies a narrow rail slope to produce consistency of response, and a traditional tip thickness for ease of articulation. Ideal for the advancing student and professional. Expertly designed and made in the USA from naturally-grown cane from D'Addario's own foreign fields. Thick blank reed produces a rich, warm tone. Consistent resonance due to spine design. Traditional tip thickness for balance of easy articulation but percussive response. Produced from premium cane, supplied in boxes of 10 reeds.